On April 18th, Global Solar Leaders Dialogue, a significant event during SNEC 2017 was convened grandly in Shanghai. PhD YANG Liyou, General Manager of JINERGY, the leading PV modules manufacturer of Shanxi Province, delivered a keynote address themed by “LCOE Drives Continuous Industrialization Technology Progress” and attended the gloabl solar leaders dialogue themed by “Global Market Trends”. April 7th, 2017, Huangshan, Anhui Province— CTPS 2017 (The 2nd China Solar Power Generation Tracking System Technology Application Seminar), hosted by Photovoltaic Green-ecosystem Organization(PGO), Organizing Committee of AsiaSolar Photovol-taic Innovative Technology & Product Exhibition (AsiaSolar), China Alliance of Solar Tracking Industry(ASTI), and Anhui New Energy Association(ANEA), was held grandly. As the No.1 local PV modules manufacturer in Shanxi Province, Jinneng Clean Energy Technology Ltd. (hereinafter referred to as JINERGY) was present in the seminar. 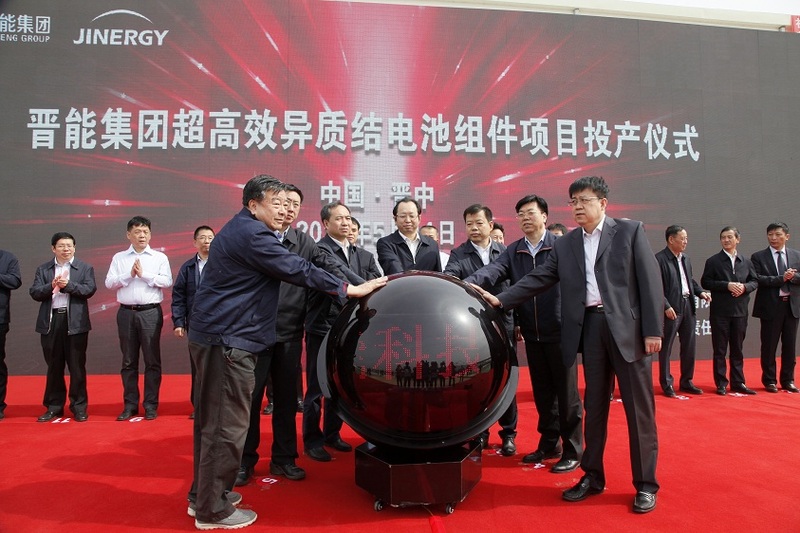 Doctor YANG Liyou, general manager of JINERGY, delivered a keynote speech “LCOE Promotes Continuous Progress in Industrialization & Technology”. Recently, Jinneng Group Co., Ltd. (hereinafter referred to as “Jinneng Group”) has announced that it will construct a strategic alliance with SunEdison - the world's largest clean energy developer to jointly develop the n-type mono-crystalline silicon heterojunction solar cells & modules with mass production capability, thus promoting the cost of photovoltaic power generation to be decreased by 20% or above. Since the beginning of 2017, the PV power generation technology, focusing on efficiency and reliability usually, has been presenting a diversified and sophisticated trend. This reflects the fact that PV industry insiders have become increasingly aware that the high efficiency is the basis of sustainable healthy development in the industry and the decline in LCOE. On 15 October, the 16th China Photovoltaic Conference (CPVC) co-sponsored by China Photovoltaic Society (CPVS) and Nankai University was held at Tianjin. This session focused on innovative development of advanced PV technology, aiming at discussing and exchanging technological innovations and academic results in scientific research innovation, so as to expand international cooperation and facilitate the sustainable & healthy development of domestic PV industry.